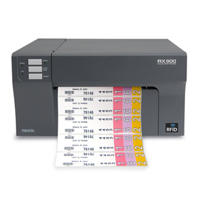 The new printer from Zebra Technologies allows RFID-enabled plastic ID cards to be simultaneously printed and encoded. The encoded ID cards can be used for a wide range of identification purposes such as driver’s licenses, student ID cards, loyalty and VIP access and other access-control scenarios. The cards form the nucleus for epcSolutions’ TetraGate 2 RFID and biometric access control system. With these printed and encoded cards, it is possible to obtain a read range of 20 to 25 feet for access control, the company said in a press statement.